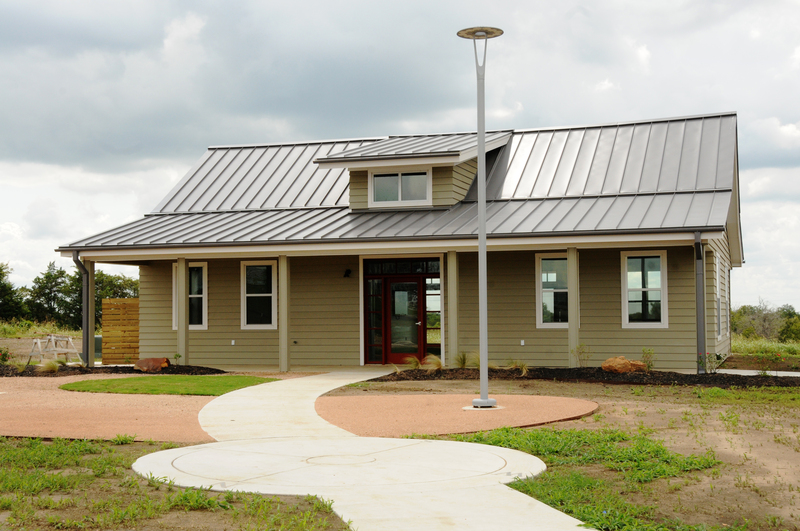 Bluebonnet’s high-tech, energy-efficient 1,285-square foot demonstration house features solar panels and a wind turbine, a geothermal heating and air conditioning system and Energy Star appliances. A high-tech demonstration house built with energy-efficient, sustainable construction methods and materials, renewable power generation and a geothermal heating and cooling system is just one of the features at Bluebonnet Electric Cooperative’s new campus in Brenham. Community leaders from around Bluebonnet’s service area and co-op officials marked the official opening of the 21-acre site in October. The 1,285-square foot demonstration house is constructed with highly efficient structural insulated panels, which reduce heating and cooling loss by as much as 40 percent, high-efficiency windows, cement board exterior panels that protect against the elements and provide ventilation, and a heat-reflective metal roof. The house features a geothermal heating and cooling system that uses the Earth’s temperature to maintain a comfortable environment inside. It also features a 2.4-kilowatt wind turbine on a 45-foot tower and a 5-kilowatt solar array to generate some of its own power. The campus also includes an 11,000-square foot service center and warehouse and a 5,600-square foot maintenance building. They also incorporate a 2.4-kilowatt wind turbine and a 5-kilowatt solar array. Three cisterns, capable of holding 63,000 gallons, capture enough rainwater to irrigate the site’s drought-tolerant landscaping. Bluebonnet is in the process of obtaining Leadership in Energy and Environmental Design, or LEED, certification for the campus. LEED is a prestigious certification system from the U.S. Green Building Council that rates a building’s design, construction and operation in terms of environmental impact. Bluebonnet will host tours of the Brenham demonstration house for groups of all kinds and sizes, including families considering remodeling their existing home or building a new home, classes from elementary school to graduate school, and any other group interested in learning about energy management, renewable energy and sustainable building practices. To arrange a tour, call a Bluebonnet member service representative at 800-842-7708.